Liquitex Professional Artist Acrylic Colours are the most permanent paints for fabric and are available in three distinct bodies. They offer exceptional quality, durability, adhesion and the largest assortment of pure pigments of any professional quality acrylic paint. Heat setting, steaming or chemical fixing is not required and a variety of applications are possible. Liquitex Acrylic Colours can be used on cotton, cotton-poly blends, woven, knitted, felt, terry cloth, silk, velvet, velveteen, corduroy, flannel, suede, leather and most synthetics. Ideal for most fabric painting techniques, especially lightweight or textured fabrics. Dries smooth and even with good leveling with few brush marks. Use for flat large area coverage, fine line detail, airbrush, stencil, watercolour, staining, dying, silk screen, calligraphy and marbling. Easy mixing with water and mediums. Exceptionally smooth, thick buttery consistency. Retains brush strokes and knife marks. Excellent for impasto. Flexible when dry, allowing built-up surfaces to remain free of cracks and chips. Pre-wash new fabric to remove sizing, which interferes with adhesion. Let dry. Adjust paint to desired consistency using Liquitex Mediums Note: For Excellent results use Liquitex Fabric Medium, add distilled water if necessary—do not over-thin. Test technique on a separate piece. Each fabric has a different absorbency and will affect paint handling. Place protective layer on work surface to prevent sticking. Stretch sweatshirts with cardboard for best paint application.) Applying thick paint to large areas will tend to stiffen fabric. Iron on low synthetic heat setting. Use a pressing cloth or iron on reverse side of fabric. Note: Loose fabric weave allows more of the colour to penetrate the fibers. Varies depending on surface, application and humidity. Paint will dry to touch in 5 minutes to 2 hours. After paint fully dries, wait at least 4 days before washing. Hand wash and hang dry is best. Do not presoak or use hot water and wash items inside out. Machine wash fabric in warm water. Use permanent press/gentle cycle. Dry cleaning machines that spin-dry fabric at room temperature are recommended. Dry cleaning suede is acceptable. Spot cleaning solutions should be avoided or used sparingly. Liquitex Soft Body and Liquitex Airbrush Medium are recommended for this technique. Mix 1 part Soft Body Colours with 1 part Airbrush Medium. Add more Airbrush Medium as needed to achieve desired consistency. Colours must permeate cloth and be seen as ghost image on reverse side to be permanent. Liquitex Heavy Body Colours and Liquitex Slow-Dri Gel Retarder are recommended for this technique. Coat a linoleum or wood block with waterproof varnish. While varnish is wet, sift finely shredded fabric (flocking) onto the varnish. When dry this absorbent surface will hold paint for application. Mix Liquitex Heavy Body Colour with up to 25% Slow-Dri Gel Retarder and spread onto the block with a soft foam roller. Wet the fabric and place the block face down onto the cloth pressing firmly and evenly. Stretch the fabric on a padded surface to help facilitate printing. Use absorbent, medium-to-heavy weight fabrics without deep texture for best results. 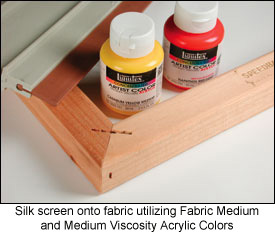 Mix Liquitex Soft Body Colours with Liquitex Fabric Medium for a softer feel to finished painting. Screw a plastic cake decorator tip onto a tube of Liquitex Heavy Body Colours and squeeze apply. Super Heavy Body Colours can be applied with cake decorator through a variety of different tips. Mix paint with Liquitex Gel Mediums to adjust consistency; apply with cake decorator to produce thick lines. Use absorbent fabric. Hand wash and Hang Dry. Wash fabric to remove any starch or sizing. Mix Flow-Aid water (1 part Flow-Aid to 20 parts distilled water) with Soft Body Professional Artist Colour. Mix 1 part colour and 3 parts Flow-Aid water to increase transparency and decrease colour intensity. Transparent and translucent colours work best and dry with a softer finish. For soft edges, pre-wet fabric with Flow-Aid water; for hard edges leave dry. Tightly woven cotton and silk will achieve richest colours. A hot wax resist may be used for hard edges. Remove wax resist by dry cleaning. All colours are permanent; no heat setting required. Wet colours will dry lighter. Titanium White and all Iridescent and Interference colours may stiffen fabric. Mix up to 25% Liquitex Slow-Dri Fluid Retarder into paint to slow drying. For heavyweight fabric use Liquitex Soft Body colours; lightweight fabric use Liquitex Heavy Body colours. Squeegee paint through screen. Wash screen with water immediately after use. Gloss Medium & Varnish can be used as a permanent screen block solution. Apply directly to screen. Paint stamp with either Liquitex Soft Body Colours or Liquitex Heavy Body Colours. Press painted side onto surface using even pressure; allowing absorption into fabric. Use either ready made stencils or cut from heavy paper, oak tag, acetate or frisket films. Use spray stencil adhesives if necessary. Apply paint with polyurethane foam dauber, rag or stencil brush. Thinning paint may cause it to bleed. Do not force paint under the edge of stencil. Use Liquitex Soft Body Colours, thinned with distilled water to desired consistency. Multiple applications can be painted over once dry without picking up underlying colours. Lightweight fabrics allow paint to spread quickly. Long-term paint adhesion can be a problem due to variations in surface, thickness, fiber structure, oil content, dye type and tendency to stretch. Always do a test sample. For maximum adhesion and longevity, the paint should penetrate into the leather. Deeper penetration will achieve greater adhesion. Remove any surface coating, shine, or smoothness by sanding with fine sandpaper or emery cloth. Remove surface oils by wiping with alcohol (denatured or rubbing) or acetone only in areas to be painted. Before applying paint, flatten and adhere leather to a stable surface. For light or bright colours on dark leather first apply Liquitex® Soft Body Titanium White thinned with 25% distilled water to the painting area. Follow any of the already discussed Fabric Painting Techniques. Wipe with damp cloth or mild soap and water. Paint may crack if leather is stretched beyond the binding capability.